Moon Knight/Marc Spector (plus he has the multiple personalities) is of course a character I absolutlely love. He and Luke Cage are quite possibly my favorite characters. 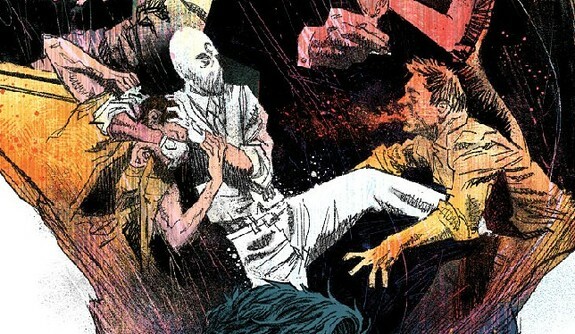 I first discovered Moon Knight during Charlie Huston's run which was amazing, went back and read the early stuff by Doug Moench which was also incredible, and have checked-out other Moon Knight comics old-and-new since that have varied between great (Warren Ellis' run, and Brian Wood was solid)-to-okay (Bendis did a fair job even if it basically was just an excuse to set-up, "Age of Ultron.") to horribly underwhelming (Some of that 1990's stuff is weak). 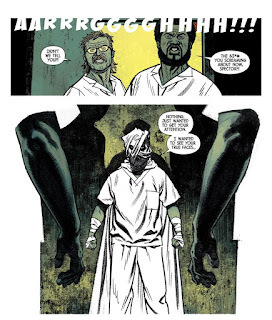 Comics about Moon Knight can vary in quality, clearly. 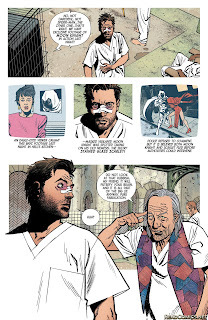 What is interesting about Moon Knight is that even though he isn't the biggest-name character, since Huston did a run of the character he has almost always had a comic in-print about his solo adventures, or with him on a team (remember his stint with the, "Secret Avengers," as they were called? ), which of course makes me happy. 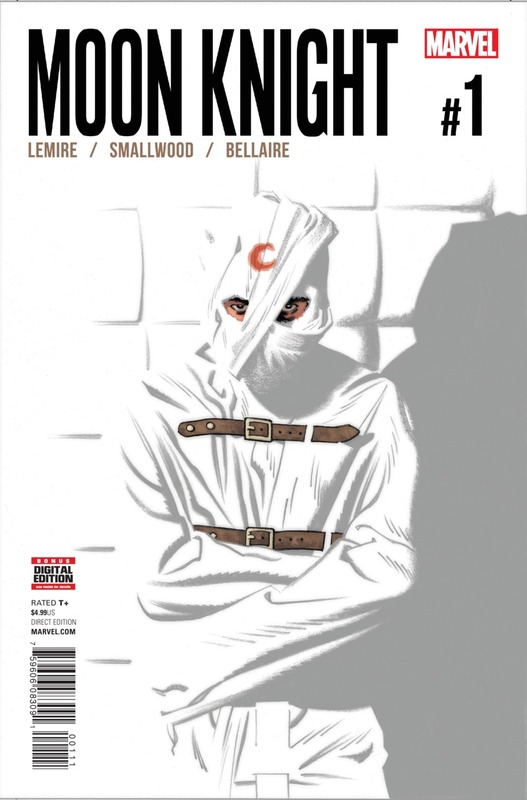 While it makes me happy, I wonder how well these books do, as they always seem to get cancelled but then come back with a new creative team as if Marvel realizes when done properly Moon Knight is superb and not merely a Batman knock-off as some have always accused him of being. Yes, it is, very much so! Well, it takes a somewhat cliché concept but morphs it a bit so that it actually works. The idea is that Marc Spector is in a mental institution where things aren't quite right. He's told there is a Moon Knight, but it ain't him, its just a delusion he has had ever since he came to the institution years ago to think he is that hero. The thing is, other people in the institution are familiar to him (and he to them) so he figures it must be an elaborate ploy. During hallucinations/visions he meets with his God, Khonosu, who tells him that other Egyptian deities are trying to to break into reality and have tricked Spector into thinking he's just a crazy person. The thing is, even Khonosu admits Spector could fully well be utterly crazy, but amusingly asks if it really matters. So, the three issues so far are Marc and his friends working at escaping from the institution and finally appearing to make good on that goal at the end of the latest issue. That good? Yes, that's pretty detailed! 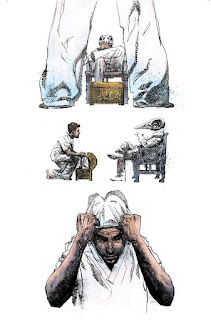 I wanted to ask though, do I need to be a Moon Knight junkie to follow this? No, you really don't. 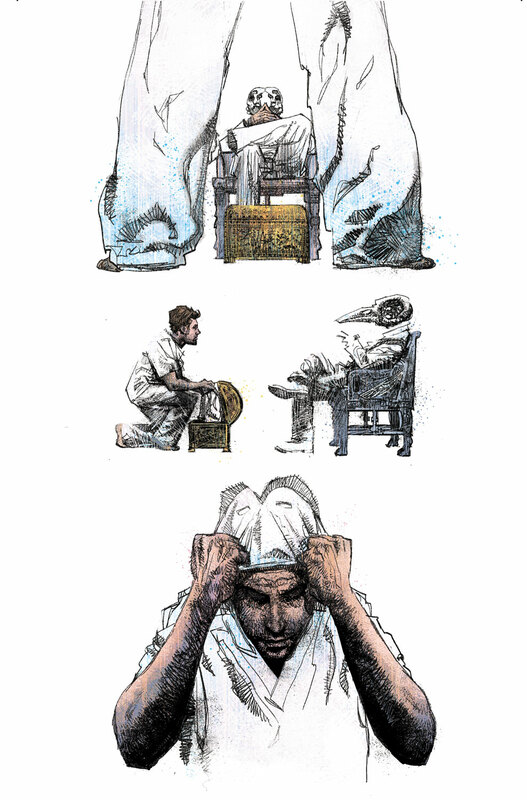 The book basically lays-out everything clearly for readers and has allusions to the older and more recent past, but is quite friendly to anyone just now dipping their toe into the Moon Knight mythos. Okay, so how about the art? The art is incredible. Greg Smallwood absolutely kills it. He alternates his style perfectly, having reality in straight clear lines and the fantasy-scenes in a more almost-hazy kind of appearance. It's gorgeous stuff and works perfectly in the book. Earlier you said the general story idea is a bit of a cliché. Does that hurt things much or is it done well enough the reader won't mind? Well, the plot of, "Hey, the hero is being told they're crazy and their beliefs are not real," happens so often in books it has become overplayed. I mean, of course the characters are actually heroes and they are temporarily being fooled! 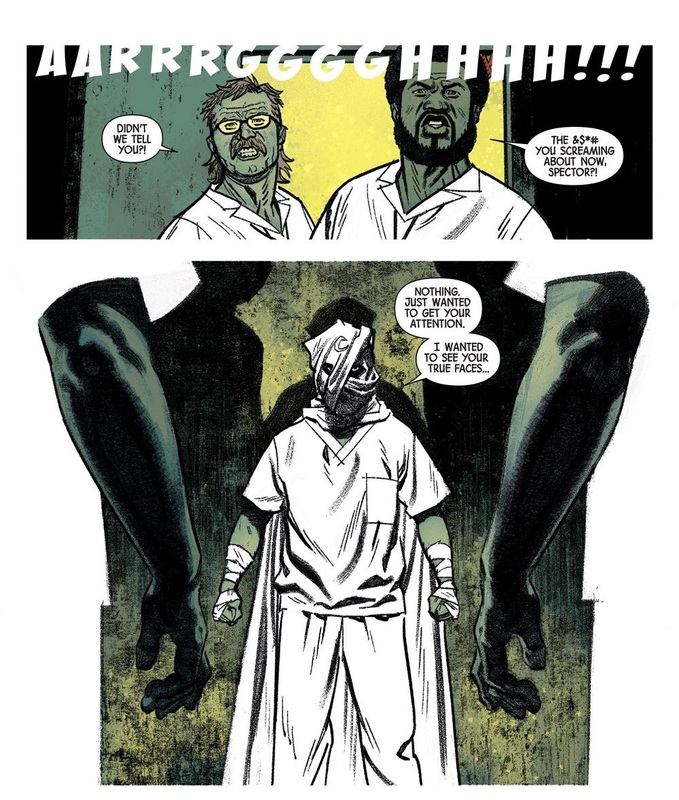 The way Lemire gets out of this seeming too hackneyed however is that he does introduce the fact that Marc Spector is told how there is a Moon Knight out there fighting crime, he's just told he is crazy to think it's him. That actually introduces some legitimate doubt into the story, because normally in these plots it is the kind of thing where the heroes are told they are in a world with no super-folk, etc. Yet, here people are like, "Oh yeah, we have Spider-Man, Moon Knight, and all those folk, you're just silly to think you're one of them though." It helps save things from being too rote, with the plot also being helped well in the scene where Spector is told by the very God he worships he could just be batshit crazy, but likes feeling like he has a purpose. So you'd recommend the book? Yeah, I'd most definitely recommend this thanks to its stellar writing, amazing artwork, and the fact that it has Moon Knight. 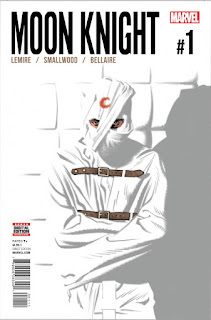 I'm a total Moon Knight junkie and will buy even the worst stuff that features him, but I'm happy when it is a comic that's really good like this one. I'm not quite certain how this story-arc will end and where it will go, but if it can keep-up the intriguing way of telling the story and keeps having fantastic artwork I'll be eager to read it--and the next issue comes out soon as well! I would give these first three issues 5 out of 5 stars and eagerly say folk should read them. As I said in my Q&A with myself, this is some great work from Lemire and Smallwood. You should pick up this book without a doubt, because if more people read it hopefully it will last a good chunk of issues. Then we will eventually get a Moon Knight movie or Netflix show and I can eager watch them. That's my theory at least. Please don't crush my dreams.